1.Die cut the bird, sentiment and balloons on adhesive foam. For each die cut shape, peel the adhesive sheet off and place a piece of foil on top of the die cut (shiny side facing up) rub your finger over the top of the foil then slowly peel back the foil to reveal your foiled design. TIP: If any of your foam isn’t foiled just repeat the process again to capture any missed detail. 2.Cut a piece of white card to fit behind your Dovecraft frame, add strips of double sided tape to the white card. Add your chosen foil across the top of the tape and slowly peel pack to reveal your stripy pattern. Adhere the card to the back of the Dovecraft frame. 3.Glue your frame at an angle to a piece of 12cm x 17cm piece of card stock, then adhere the cardstock to your card blank. Add the sentiment across your Dovecraft frame. Glue your balloons to the top of the sentiment. 4.Stick the bird to the bottom right of your frame. 5.Add some dots across your card using the foil glue and once the glue has turned clear, add foil across your glue dots and peel the foil off carefully. 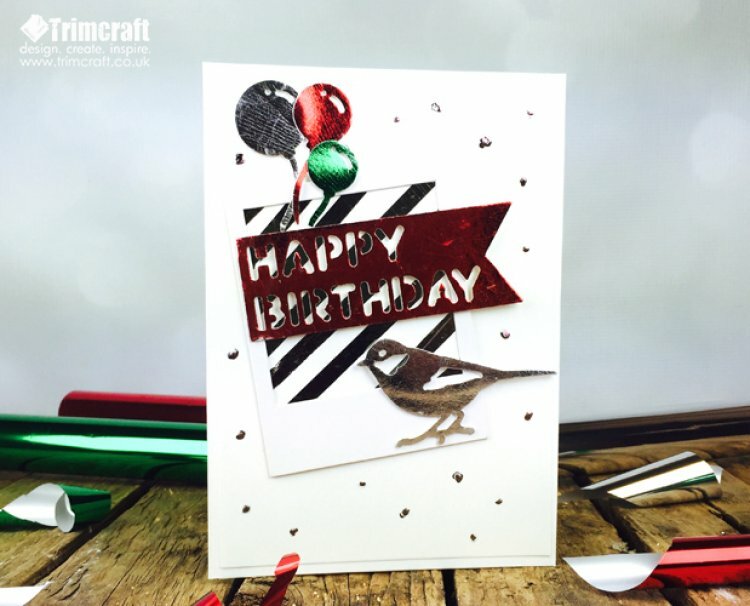 We love this inspiring make and with the diverse range of First Edition die designs, you can use foil for a range of fun occasions. What dies will you use on your cards? Remember to upload your makes to the project gallery for everyone to enjoy!